The UK will hold overnight public vigils across the country to mark the centenary of the Battle of the Somme, the Culture Secretary John Whittingdale announced today. The national vigil will be held at Westminster Abbey on 30 June and there will also be vigils in Scotland, Wales and Northern Ireland so as many people as possible can come together and remember those lost at the Somme. A National Commemorative Service will also take place at Manchester Cathedral on 1 July 2016 and will be followed by a people’s procession through Manchester to Heaton Park. The event will close with live performances of music, spoken word and dance, featuring the Hallé Orchestra. “We must never forget the scale of what happened at the Somme. 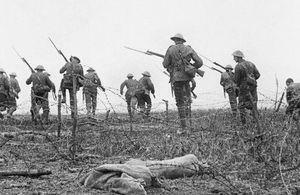 More died on the first day of battle than any other day of the First World War. Almost every family in the country was touched by the devastating losses. The Welsh National War Memorial, Cardiff. The Battle of the Somme saw over one million wounded, killed or missing on the battlefields and affected the lives of millions at home. The Royal British Legion and Commonwealth War Graves Commission hosting a daily Remembrance ceremony at Thiepval at 11am GMT (12 CET) from 2 July – 18 November to mark the 141 days of battle. Communities throughout the UK are encouraged to host local events linking to the ceremonies in Thiepval. There will be a number of events taking place across the battlefields at CWGC cemeteries and memorials, and the CWGC will be supporting organisations planning events. Communities interested in projects exploring the impact of the Battle of the Somme in the trenches or on the Home Front can apply for grants from the Heritage Lottery Fund’s First World War: Then and Now £4 million fund. Communities can also apply for funding to conserve and repair their war memorials as an act of remembrance. “The Commonwealth War Graves Commission is delighted to be working with our partners in the UK government and the Royal British Legion to support a series of activities that will mark the entire 141 days of the Somme offensive, both in France and the UK.